1. 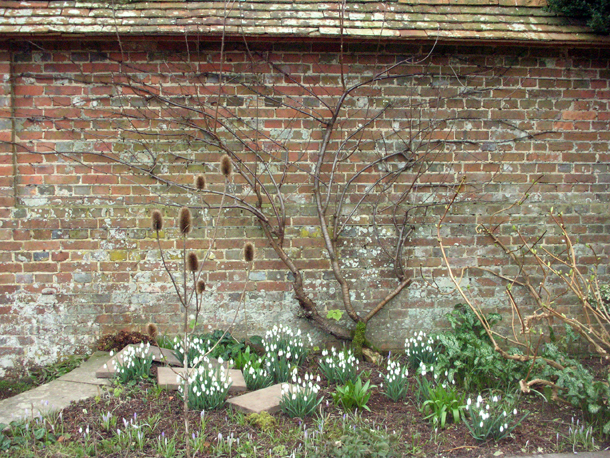 Galanthus 'Atkinsii' - the tallest & biggest one and a good self-coloniser. 2. 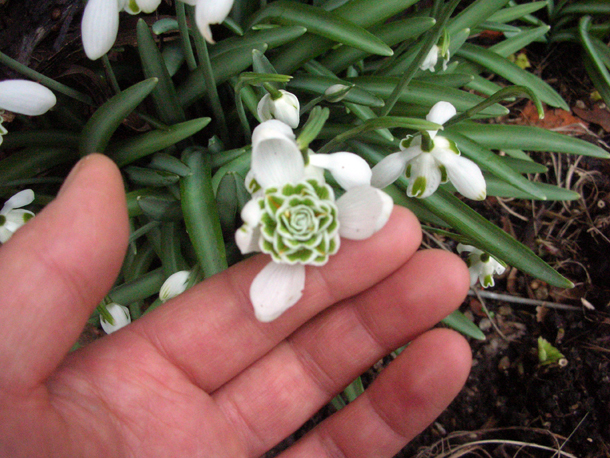 Galanthus 'Hippolyta' - one of those that has a beautiful intricate pattern worth lifting its head to admire. 3. 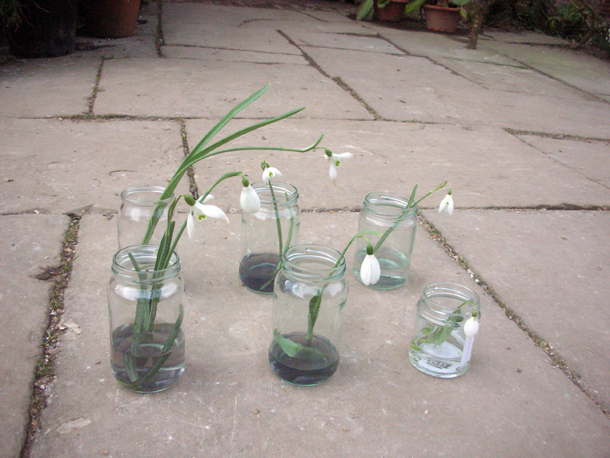 Galanthus nivalis - the common species snowdrop. 4. 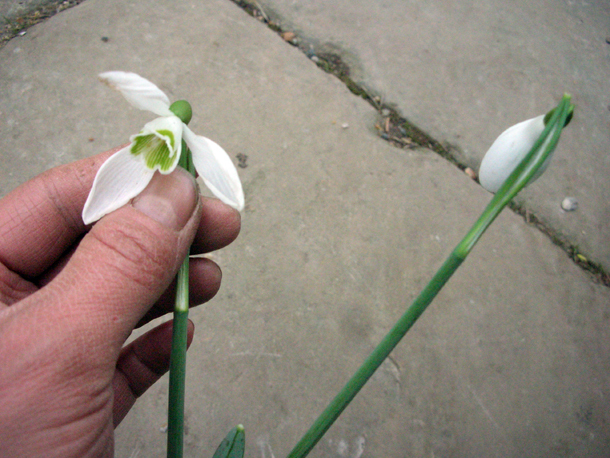 Galanthus 'S. Arnott' - which is one of the best ones for scent, like nivalis it is meant to smell like honey. 6. Galanthus sp. - rare unknown one that is also really fragrant. 1. 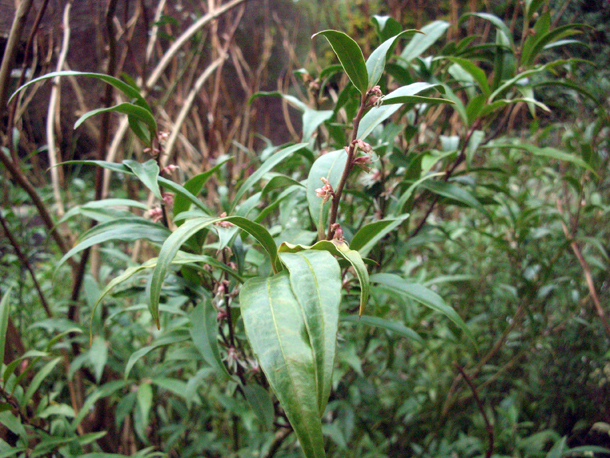 Sarcoccocca ruscifolia (named so because it has ruscus like leaves; Buxaceae family). 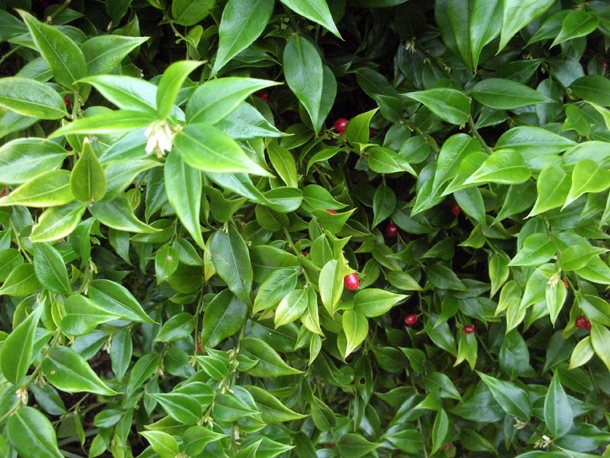 Has red berries. They are originally from South-East Asia and the Himalayas. 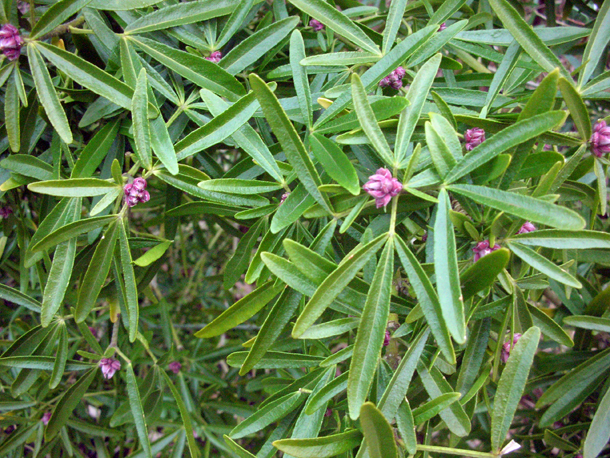 All Sarcoccocca has that honey sweet scent, and are wonderful slow growing evergreen shrubs that is quite happy under shade. 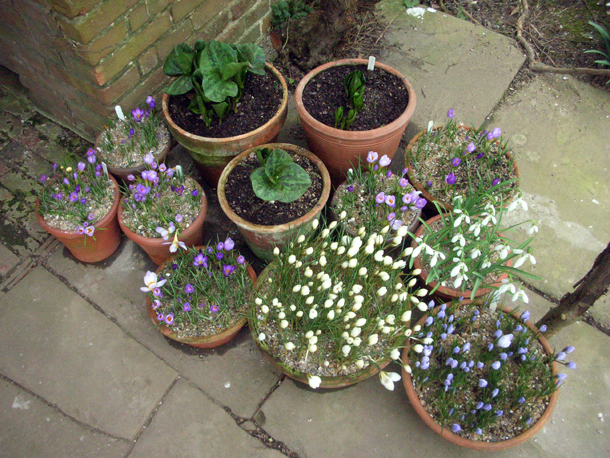 At Dixter they have self-seeded in different places. 3. Daphniphyllum macropodum (the sole genus of the Daphniphyllaceae family). 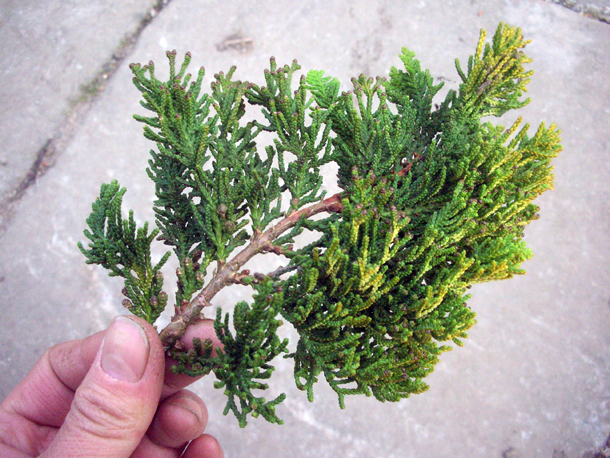 A shrub or small evergreen tree that is from China, Korea, Japan. 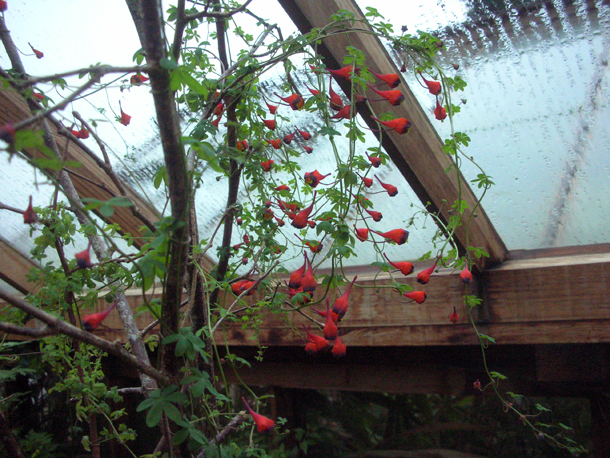 One of the plants that is resplendent all year round and frames the cellar area. 4. Eryngium pandanifolium. Had this in a couple of idents. It last appeared in the Umbellifer, a surprising member of the Apiaceae family. 5. Astelia chathamica (Asteliaceae family). 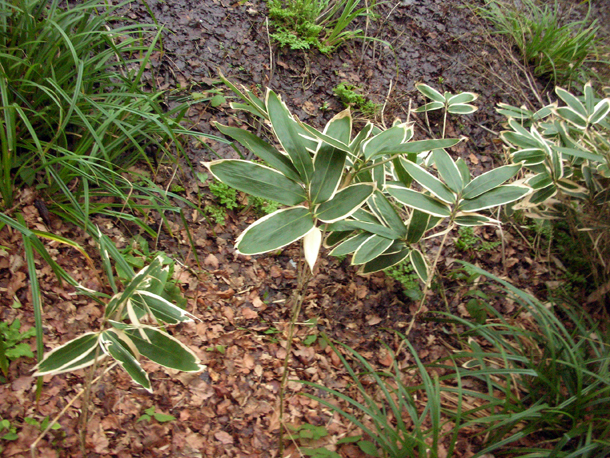 A silvery evergreen bush, the genus is native to the Pacific region. 6. 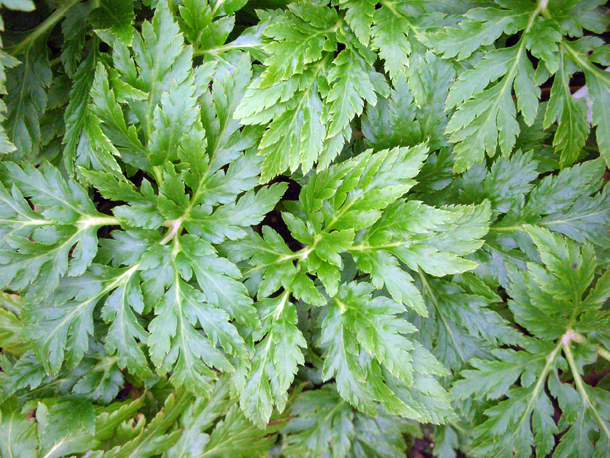 Geranium palmatum (Geraniaceae family). Hardy geranium from Madeira that has bright pink flowers in summer. 7. 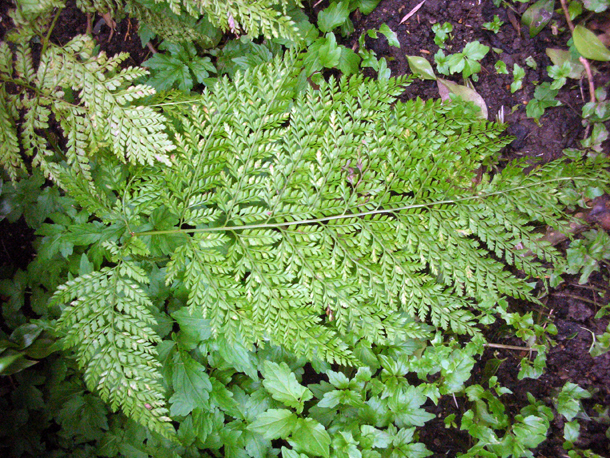 Dryopteris erythrosora (Dryopteridaceae family). Native to countries like Japan, China and South of the Phillipines. It can tolerate drier soils but prefers moist, humus-rich soils. 8. 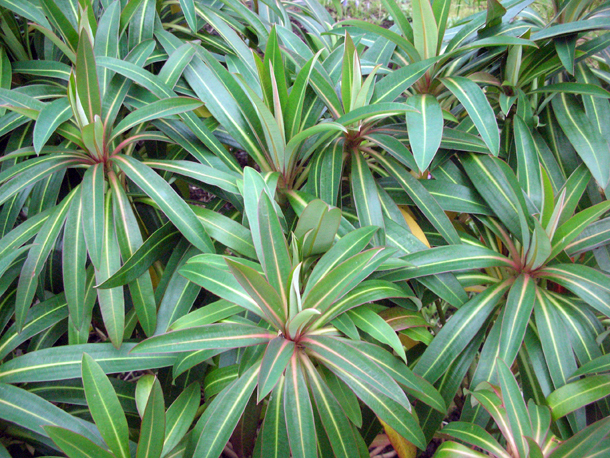 Euphorbia mellifera (Euphorbiaceae family). 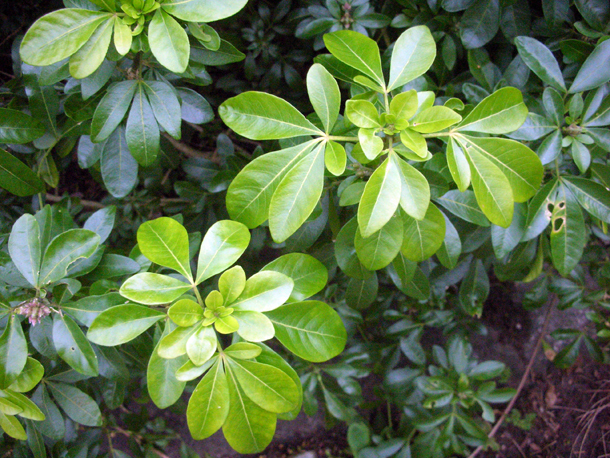 All euphorbias has a milky white irritable sap, in order to stop it bleeding you can dip cut surfaces in lukewarm water or charcoal. This one has brown scented flowers in spring. 9. Choisya ternata aka Mexican Orange Blossom, part of the rue Rutaceae family. It has fragrant citrussy white flowers. 11. Danae racemosa it is the only species of this Genus (monotypic) and is part of the Asparagaceae family. 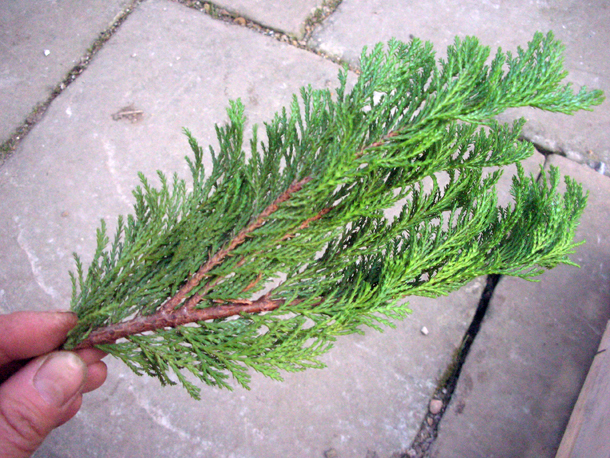 It is a curious evergreen shrub, as its leaves are actually modified stems sort of flattened at the end. 12. 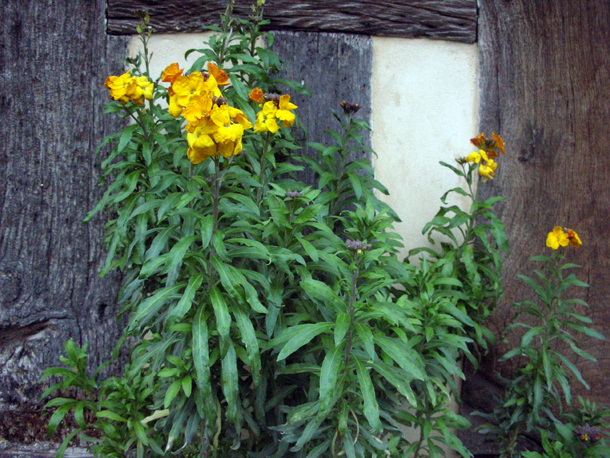 Erysimum cheiri, the original wild wallflower native to Europe. This one has self-seeded into cracks outside of the house and has been impressively flowering since January. Apologies to the people who actually read my blog that there are often long gaps periodically between posts, but life gets incredibly hectic sometimes and I get a bit behind. 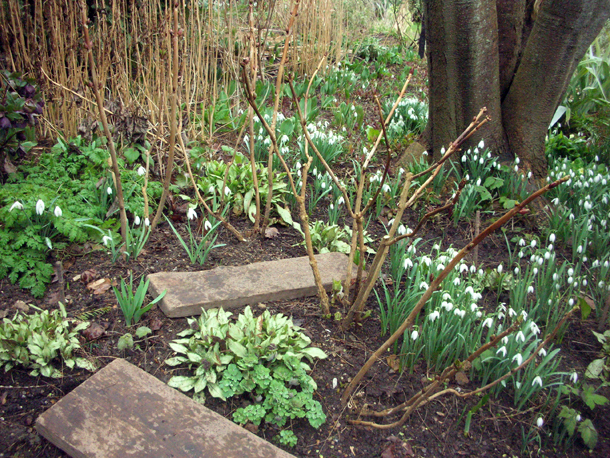 In the next few days there will be a few bumper posts to get up to speed of what I have been up to in the garden. I'm also sorry if the posts are sometimes a bit technical & dry, as this is part of the way that I have to keep my journal as part of my scholarship. Hopefully the photos keep it interesting! Weather: Cold but sunny, still a bit of snow present from the past two days (there was a blizzard on Monday). Very dry. 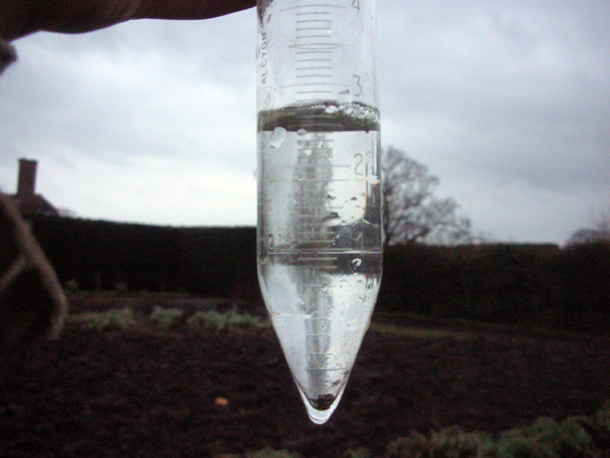 5°C going down to minuses again in the night. Worked in the nursery - learning the best and easiest ways to do things. 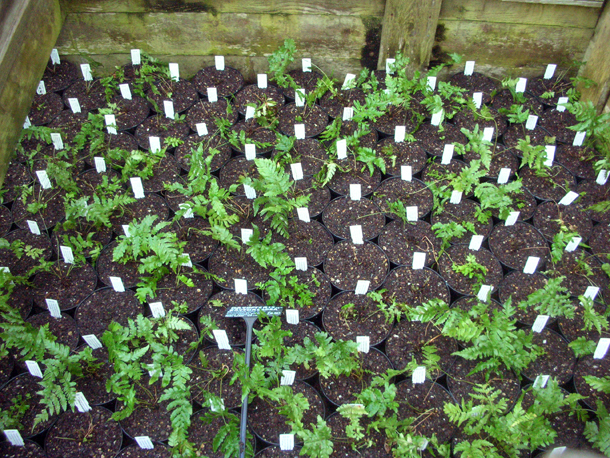 I cleared out a lot of sorry looking ferns that were to be repotted from a large cold frame. I dug out the old grit from this frame because the level of it had gotten too high. 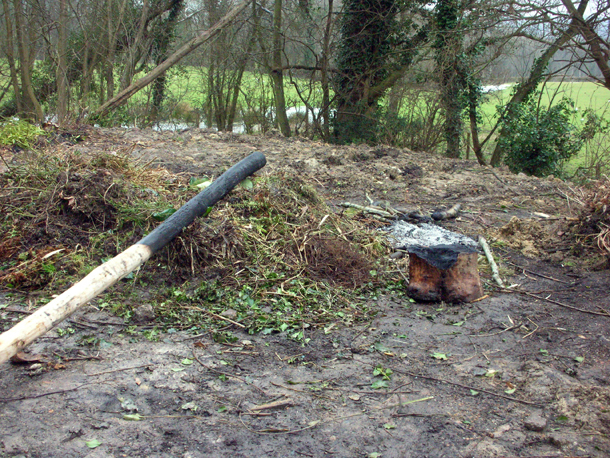 Initially I thought this would be quite a hefty task as I found the grit knotted with roots that had grown underneath, but Fergus showed us how to skimmed it off with the spade by using it horizontally so that the surface remains as level as possible too. Using a small flat board after to smooth it over, like plastering or concreting. I poured the old grit into the old soil pile, and put a fresh layer of new grit on top. Again levelling it out like plaster with the board. Weather: Cold & frosty to begin with, but went up to 5°C. Sunny. It's now already much lighter at 6am and lasts well up until 6pm. 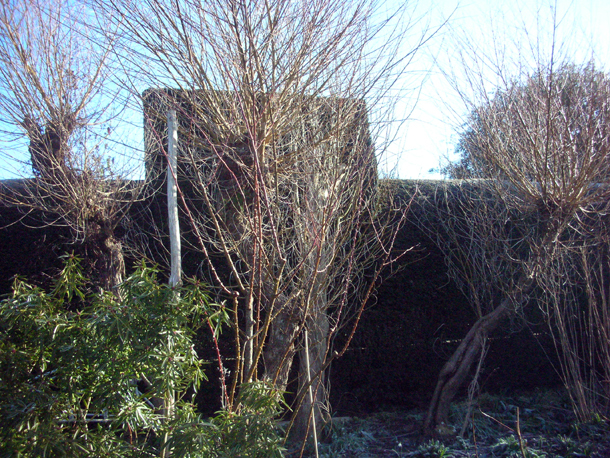 I pollarded some salixes (cutting off all their stems) in the Long Border. Usually I don't like this method, but they were such old & gnarly knuckles of beautiful shapes, that again it made me appreciate that it is how you do things and what context the is. 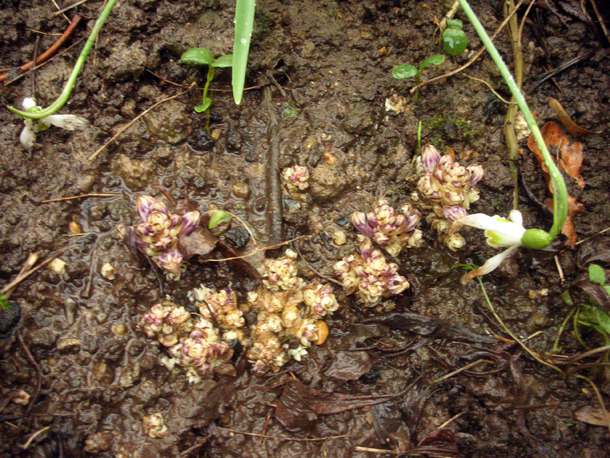 Above are the buds of the curious parasitic plant Lathraea clandestina aka Purple Toothwort that mainly live off the roots of salix and poplars. It is part of the family Orobanchaceae (the broomrape family). 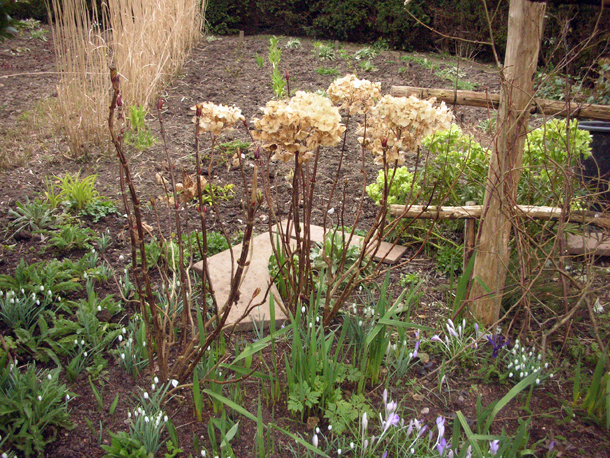 We made poles out of chestnut wood to replace ones in the Long Border for a Lonicera & a Clematis. I didn't realise we used a really old but effective method to make them. We stripped off the bark off the chestnut to the paler part. Then we 'carbonised' the end of the pole by burning it until a snake skin like pattern appeared. This makes it water/ rot proof. It was most important to ensure that the 'collar' is carbonised - the section that is just below and above the surface of the soil. With this method the pole will lasts about 7 years which is more than your average fencing, which is about the same as creosote (banned now) or the stuff that they use to treat wood commercially now. Carbonised pole on the left, the stump on the right is what is used to help keep the pole just above the fire. Weather: It was about 4-5°C but felt much colder as there was a really biting high wind today. Even the hardiest of gardeners winced today. We finished helping to put the poles in the ground, and I pruned a Rosa chinensis 'Bengal Beauty' a beautiful deep pink rose that blooms on new wood. 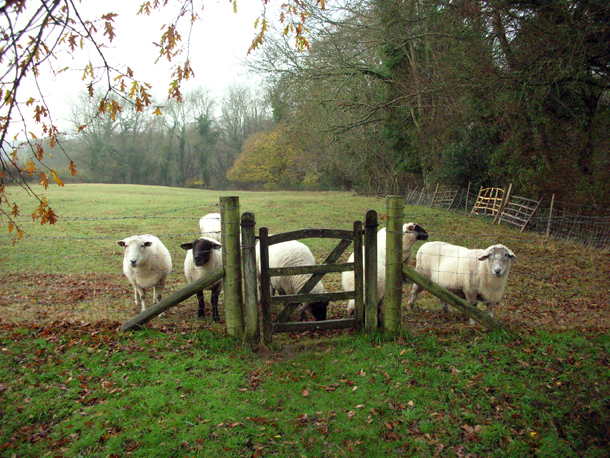 Dixter has eight resident sheep. In the past week or so they have managed to escape twice from the field that they are fenced into. They are more cunning than they seem as we were puzzled how they got out a second time. There is a scare that when they get out they will mow down all the lovely crocuses and daffodils in the meadow or goodness knows what they decide are delectable delights on the Long Border. I have witnessed one of them before on their hind legs tearing at a Leylandii tree. Each time we have had to have about five or six of us forming a line and surrounding them slowly to herd them back. Sometimes when Fergus runs and claps loudly they will follow him. Even though they knew we were shouting at them, despite the fact they are extremely well fed, they would look up with a greedy guilty face and would still quickly steal a chomp any chance that they could. Weather: 8 - 9°C. Light drizzle most of the day. An atmospheric mist enshrouded the whole site late afternoon. 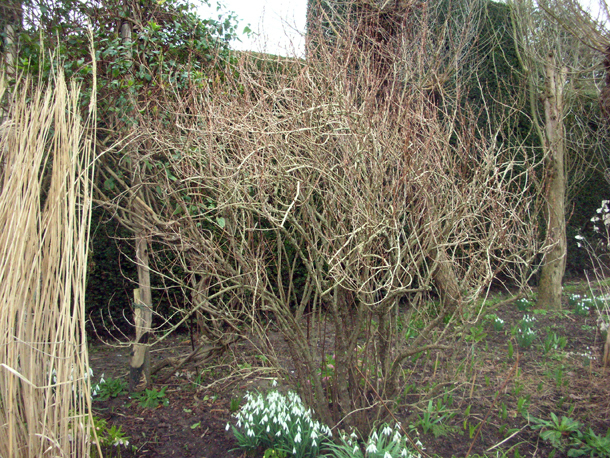 I have been pruning the spiraeas in the Long Border. 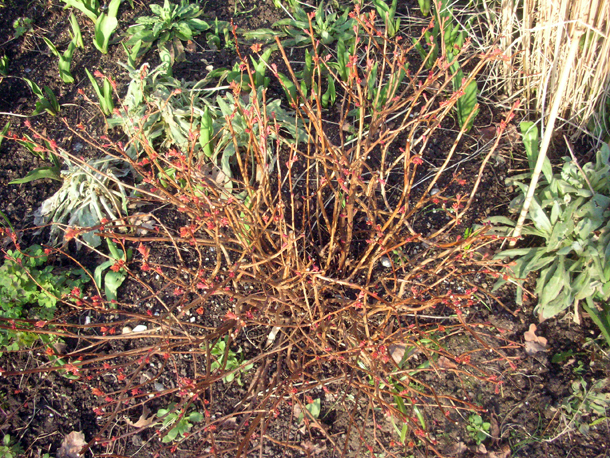 They are of the Rosaceae family, Spiraea arguta is one that has a light green leaves at this time of the year and will have wreaths of white flowers and a red one I think called S. japonica Goldflame' that will turn green later in the year and have pink flowers. These ones flower on current years wood. Spiraeas are very resilient. I took off dead flowered and really weedy parts but most of the time didn't cut a stem right down to the base but to a good strong bud. I did a much lighter touch on the red one than the green one. Apparently spiraeas are great for attracting butterflies. Section of what lawn that we do have (e.g. 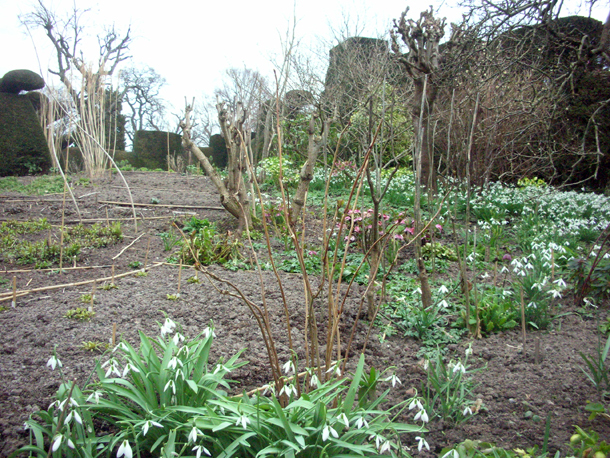 strips alongside the main orchard meadow) were fed today with a lawn dressing & chicken manure. Some of these overly worn parts will be re-turfed. I also cut down a Clematis 'Perle d' Azur' right down to the ground, as we wanted to control the height of its growth & potted up some Pleioblastus that had been split and divided into smaller pieces of one or two growing points. Weather: Around 9°C. Intermittent sun, really warm again at certain points. Then a really old rose next to the ivy shed that I had to change all the rules for - I basically had to leave stems that I wouldn't usually because so much of it had died that it couldn't afford to lose much and every new shoot was precious. Weather: Sharp, cold & misty in the morning, followed by glorious sunshine. Most of the day was about 10°C. Stripping down to t'shirts was to be seen today! It felt like a proper spring day, lots of crocuses & galanthuses were wide open. 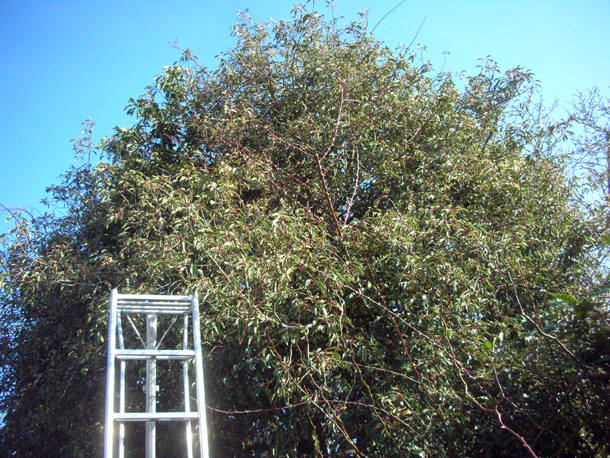 I pruned a huge Rosa called Cerise Bouquet, I only cut off any flowered shoots, as it is growing through a tree of Prunus lusitanica 'Variegata', so we wanted it to retain its strength as much as possible. 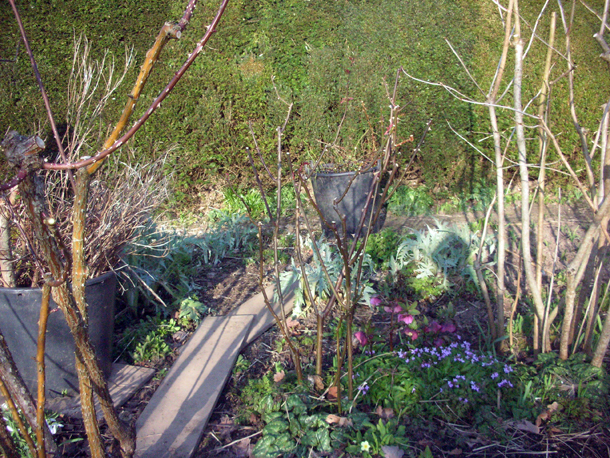 Then I worked on Rosa 'The Fairy' & Rosa 'Perle d'Or' in the long border, both flower on new wood, so I pruned them a bit differently to the ones that I have been doing, which have been on old wood. As they flower on all stems, I did the thinning and taking out of weaker or not so favourable stems as I went along, as well as taking off all flowered stem heads. I always tried to leave at least two or three buds when I cut any stem down. Then if necessary I would ensure that the rose was well shaped. Rosa 'The Fairy' in the middle and some little pink flowers of Cardamine quinquefolia starting to come out under the Hellebore. The Kew Diploma is one of the places I am seriously contemplating to do further training, because there is one side of me that is interested in people in almost an anthropological way, and their relationship with plants and how plants function. I am wanting to get behind the science of plants to enable to be even more creative with them. In a way I feel that Dixter is all about people. 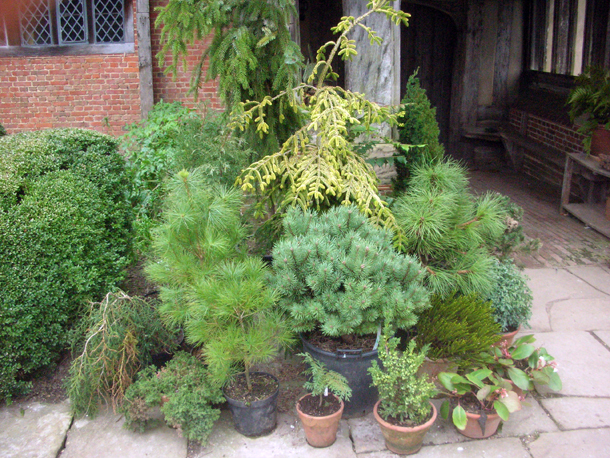 Also training at Dixter is very intense and when I move on I would like it to be something just as challenging or more. It was an exciting visit behind the scenes, we went under the Palm House and saw the tunnels where coal was transported to the furnaces that use to heat it. The arboretum was in top form with their innovative air pots which allows plants like trees to develop good root systems and makes it easier to transplant without having to grow them on in the ground first. They are currently growing 1800 species for the Temperate House and re-propagating collections like their 130 year old Hamamelis collection. They use wax to bind their grafts, and they heat only the grafted part, keeping the roots & tops cool, the whole operation was impressively efficient. We went into the Tropical Nursery where there are 21 climatic zones, at one point we were standing in a room surrounded by 100s of rare orchids. This was the part where I forgot my camera of course. 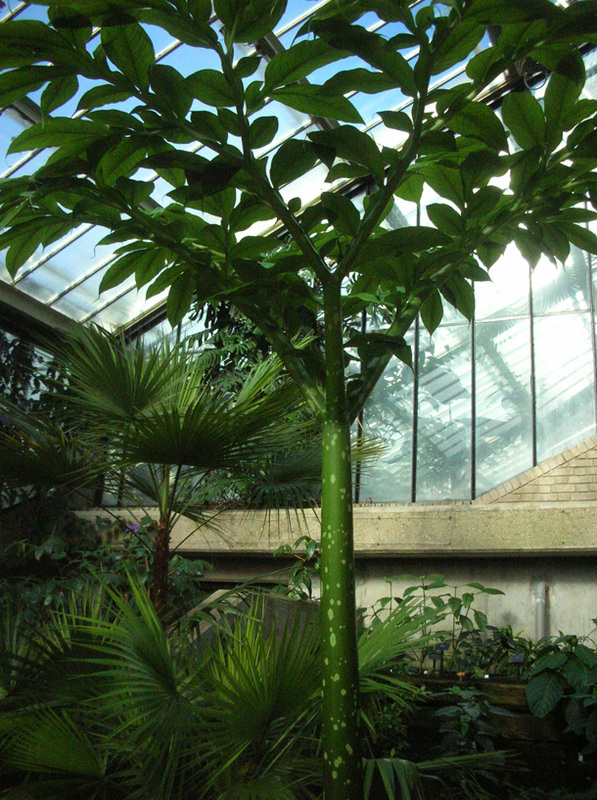 I was almost breathless when I came face to face with Amorphophallus titanum seedheads, and plants of these in different stages of growth, - the largest single flowering plant. 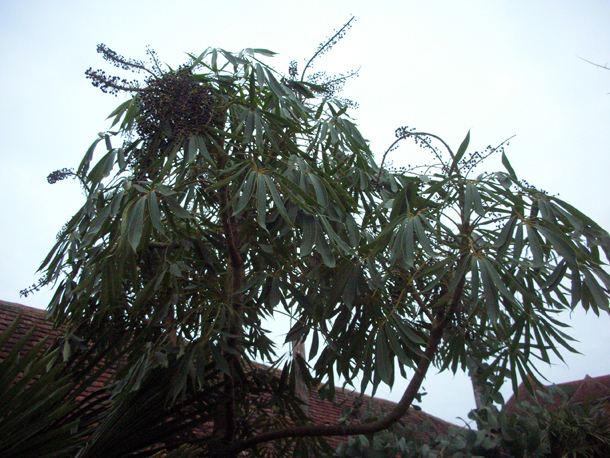 The corm of the plant will either produce a plant or leaf that resembles a huge cartoon like tree (see photo above). It brought me back to my college days when my tutor Jim had got us all excited about this plant, and was growing related species. He had one growing by the classroom window where it would open on the last week that the students were due to leave, with its carrion smell this was his departing present to us. This was only but a few of the fascinating things that I experienced. 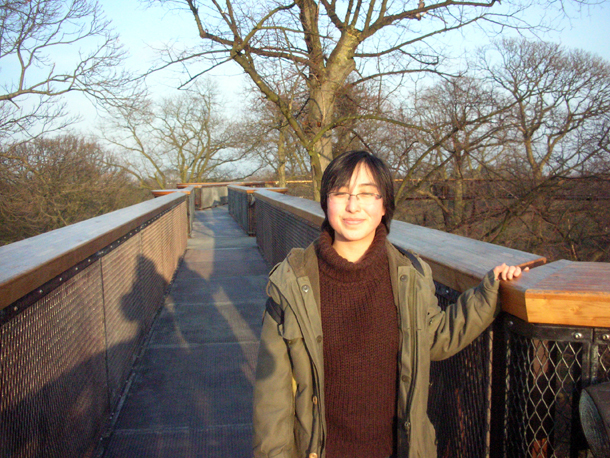 The day ended literally on a high note as we soaked up the views of the garden on the treetop walkway. 1. Phlomis fruticosa (aka Jerusalem Sage; Lamiaceae family). 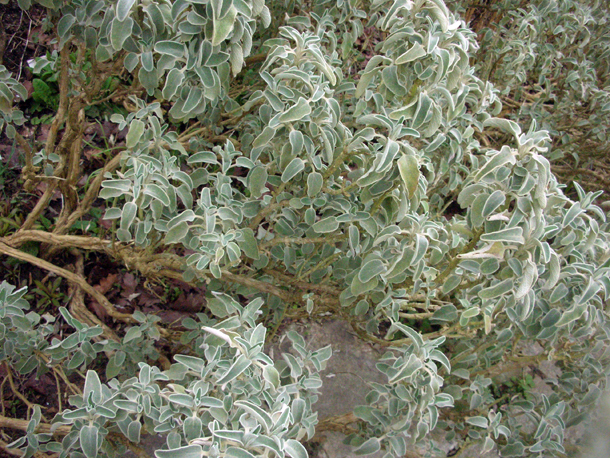 It has sage like leaves and exotic yellow flowers in the summer. It likes full sun and can be found in the Long Border. 2. 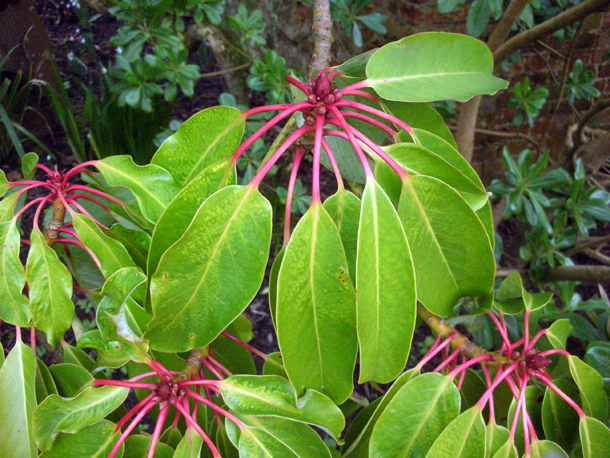 Trochodendron aralioides (Trochodendraceae family) is the only species of this genus. 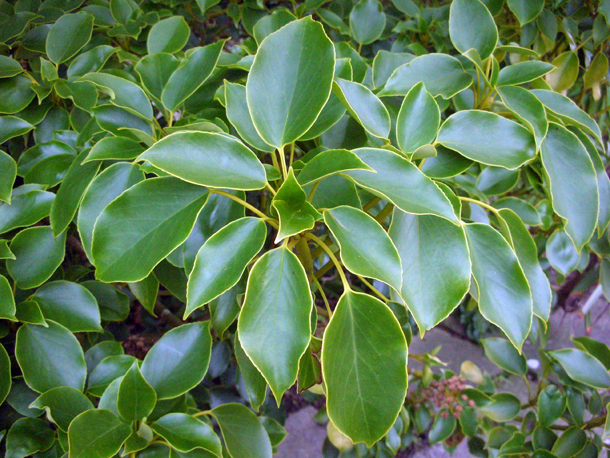 I had this in my evergreen ident but here is more info about it: a big evergreen tree like shrub, native to Japan, Korea & Taiwan. 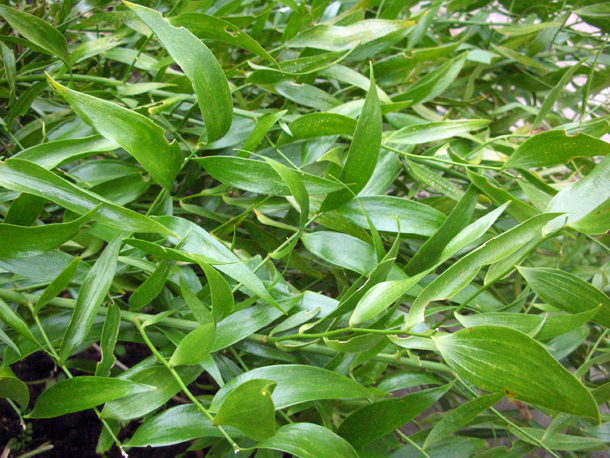 It is intriguing in that it has been known to exist as an epiphyte. 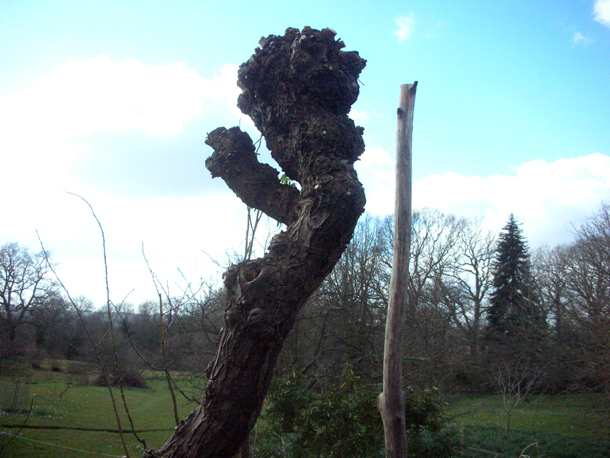 It doesn't like to be pruned! 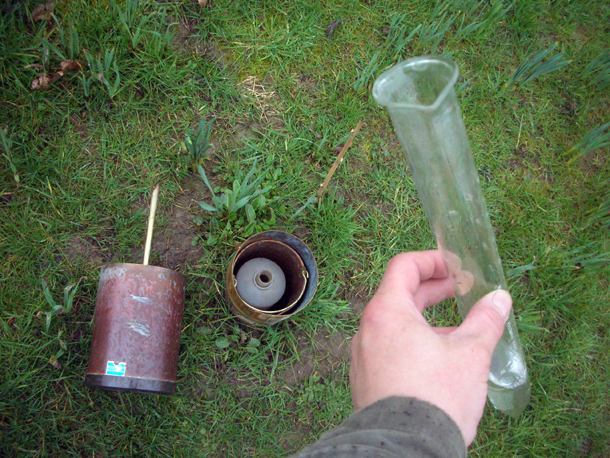 This is probably due to the lack of the usual vessel elements found in plants (e.g. 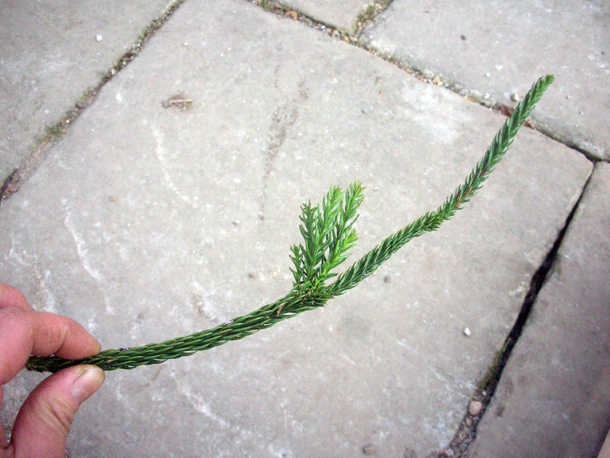 the xylem that usually carries water through a plant). 3. 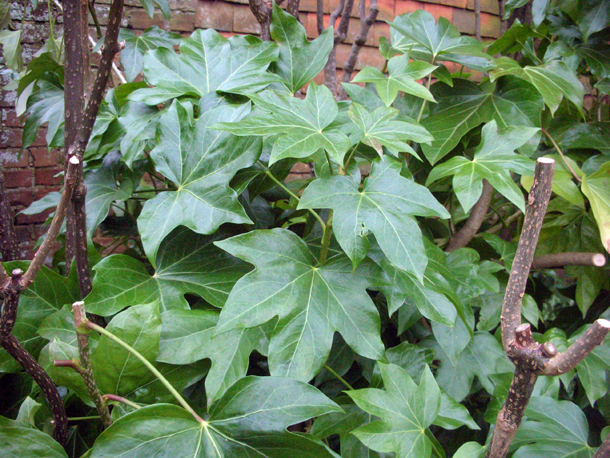 Viburnum rhytidophyllum (Adoxaceae family). Their individual leaves look like shiny patent leather with velvety paler undersides. 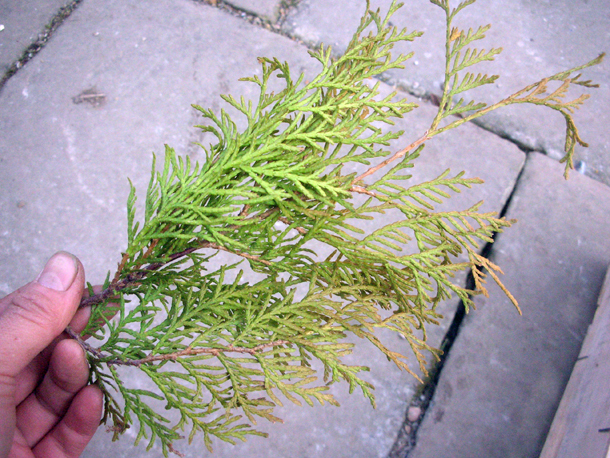 A large shrub found by the lower moat pond. 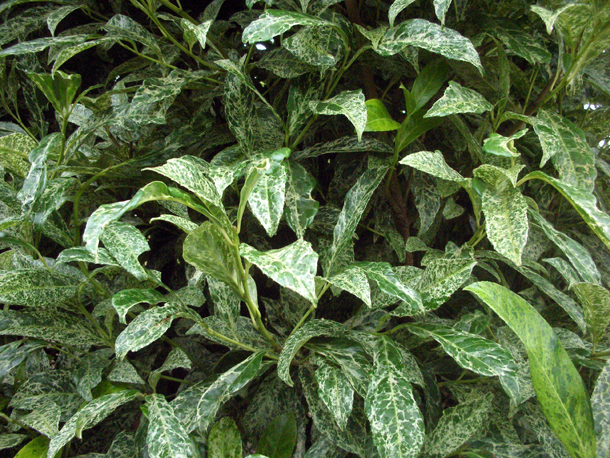 A hardy tropical plant with compound palmate leaves. It remains outside in the Exotic Garden over winter. 8. Prunus laurocerasus 'Castlewellan', another one that came up in my evergreen plant ident. 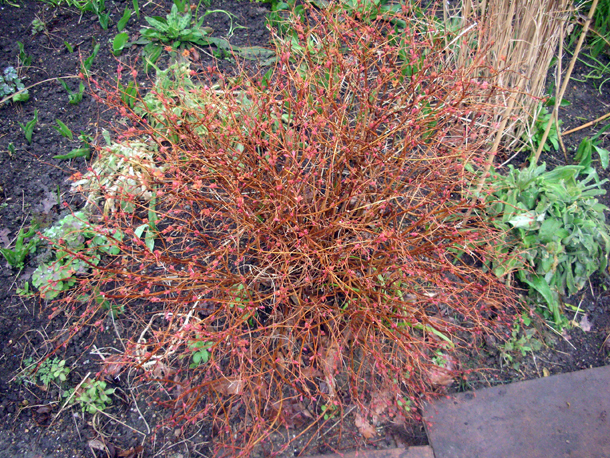 This is a large shrub found in the Long Border. 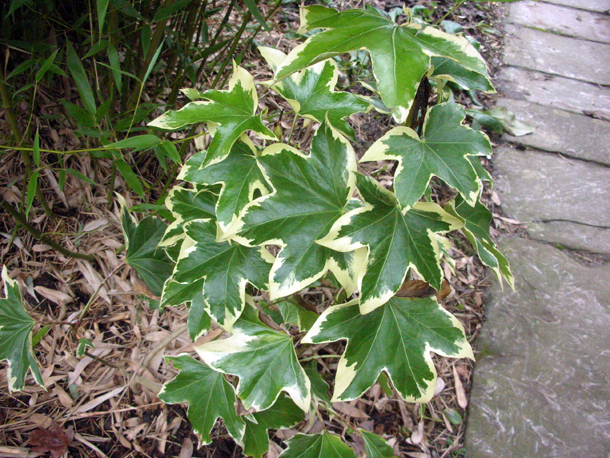 It has beautiful marbled leaves, but gardener James pointed out that due to its habit, it was a shame that the interesting patterned side tend to face upwards, rather than outwards so that it can be appreciated more. 9. Ilex x altaclerensis 'Golden King' (Aquifoliaceae family), the big domed one at the end of the Long Border on the East side. 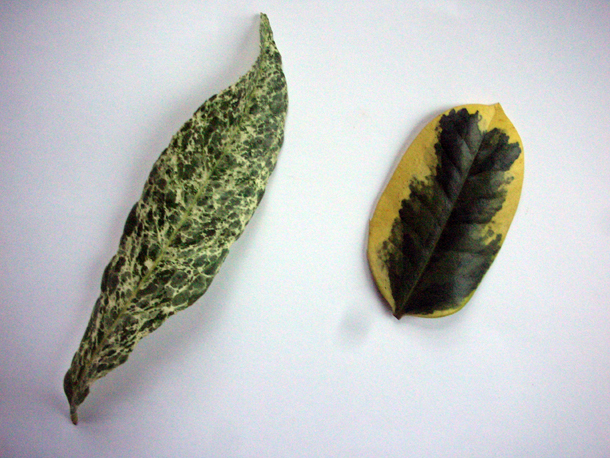 (The leaf is the one on the right in the photo). 10. 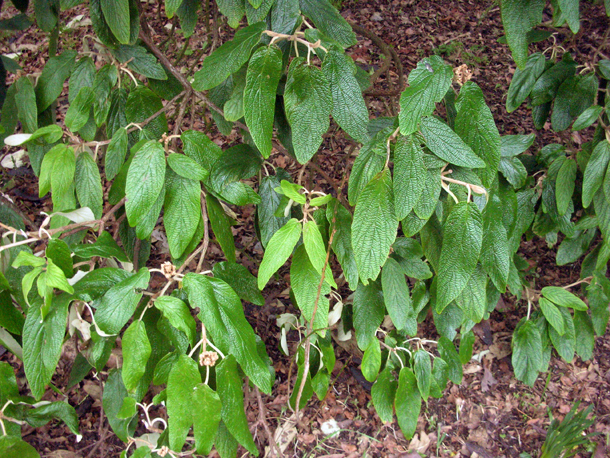 Viburnum davidii (Adoxceae family). 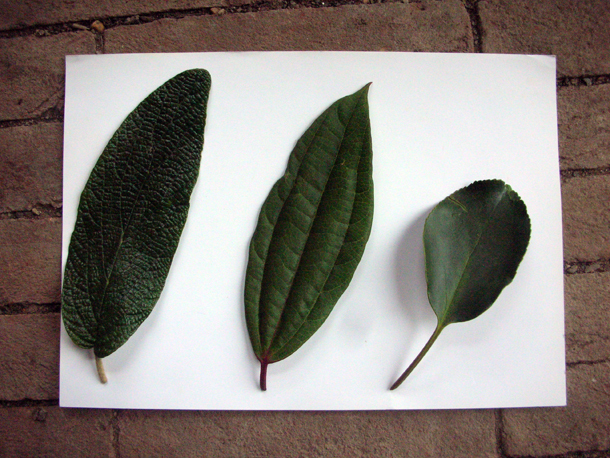 The leaf is the one in the middle in the photo below, with distinctive deep ridges. A shrub that has beautiful metallic blue berries. I have to say that the best specimen that I have seen of this is at Wisley gardens near the front. Weather: 3 - 4°C. Still quite nippy. Overcast. 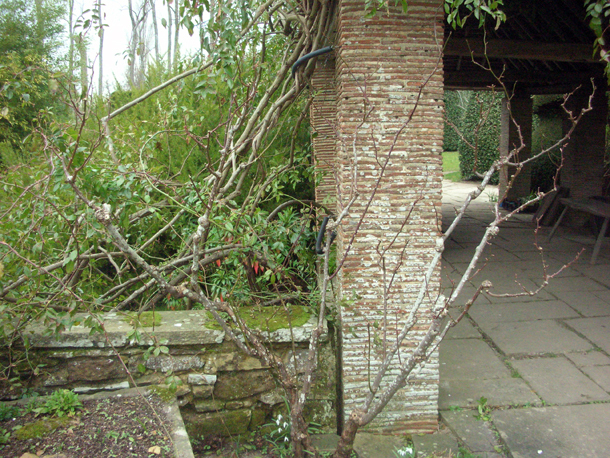 I pruned an Abelia grandiflora today, it was not so straightforward. It has beautiful tints of colours all over, from their pink calyx to their reddy hued dark green leaves. In fact their very pale pinky white flowers are lightly scented from summer to autumn - there's not much not to like about this shrub. In this instance it was important to keep the shape of this semi-evergreen and maintain the graceful arches rather than taking out all the flowered stems. 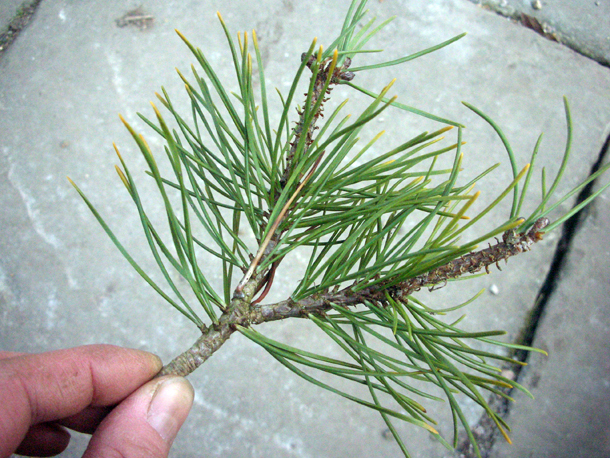 Each stem had non-flowered & flowered stems on it, technically they flower on the current years wood. So the key was to take out more skeletal growth & older paler stems, enough to give more vigorous reddish stems and for them to take over gradually. In the afternoon we pored over Chiltern's seed catalogue and decided what we would like to grow for the garden or to try out. We have already done this with Thompson & Morgan and Moles Seeds. Weather: 3°C. More degrees today but it still felt cold because of persistent arctic wind, but not as bitter as over the weekend. I trained the morello cherry Prunus cerasus today, which followed similar principles to the fig. Then I pruned some blue Hydrangea macrophylla 'Blaumeise' from John Massey of Ashwood Nursery in the long border, a Weigela praecox 'Variegata' that is apparently one of the oldest plants in the garden. I gave this only a really light touch and took out about a 1/10th - mainly dead/ flowered branches just to air it out alittle. 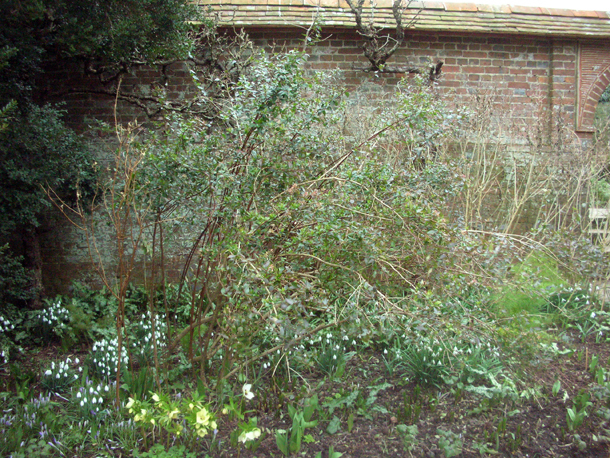 Then I moved onto an Abelia in the walled garden.